Kava may help to manage everyday stress, as well as reduce anxiety, while supporting your overall sense of enjoyment and well-being. We feel that Kava can be used to enhance your life, as a relaxed life may be a happier life. * These Kava Root Capsules have a verified 10% minimum Kavalactone content, blended with absolutely nothing, so you can enjoy the full kava experience in a convenient capsule. These Kava Root Capsules have a verified 10% minimum Kavalactone content, blended with absolutely nothing, so you can enjoy the full kava experience in a convenient capsule. 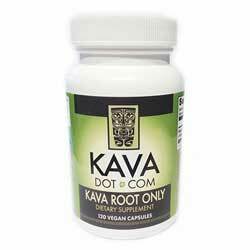 Each 300mg capsule has 30mg of Kavalactone in a completely vegan capsule. Three capsules give you about 90mg of Kavalactone, for 1/3 of the daily recommended dose of 290mg, reliably, capsule to capsule, purchase after purchase. Here at Shaman’s Garden, we couldn't be more proud to offer this Premium Kava variety, lovingly grown on the islands of Vanuatu. These capsules are crafted from the coveted Vanuatu variety. Best of all, this Kava has a very specific "happy" chemotype that could only have dreamed of seeing in a Kava root. * All Kava is not created equal! Directions: 3 capsules, three times a day. Do not exceed 9 capsules a day. Maximum period of daily use: 3 months. Use may resume for 3 months after a 2-week break.